 The Leapfrog Phonics Bus toy teaches the alphabet and new words. 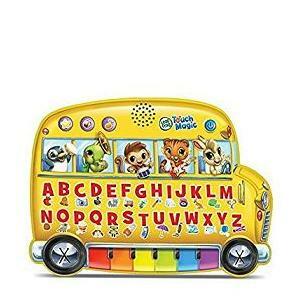 The Leapfrog Friends Phonics Bus contains many educational features placed onto a toy vehicle. Another quality of the toy is that the voice is very clear, so that kids can clearly understand and use all the functionality of the toy. The toy is sure to catch the interest of the child and help him or her learn. By playing with this toy bus and pressing the buttons, children acquire motor skills, learn the alphabet, new words.